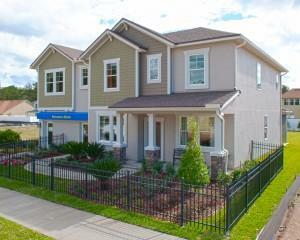 Congratulations to the Providence Homes team! Three of their model homes were recognized by the Northeast Florida Builders Association at the 2013 Parade of Homes banquet. The winning model homes recognized were The 3110 Model Home at Yellow Bluff Landing in Jacksonville, The Arlington Model Home at Eagle Landing in Orange Park, and the Normandy Model Home at Durbin Crossing in St Johns. The 3110 Model Home at 16 Hunters Hollow Court in Yellow Bluff Landing is a beautiful two-story home that offers 3,519 sq. ft. of living space, four spacious bedrooms, three-and-a-half baths, a formal dining room, study, a first floor game room, an oversized loft for the family’s leisure, and a gourmet kitchen and café that are ideal for entertaining. Life can be beautifully inexpensive in this Five Star Energy Efficient Energy Star Certified Home. HERS Rating 60 with estimated $165.00 per month electric bill. The Arlington Model Home at 4266 Eagle Landing Parkway in Eagle Landing offers 3,027 sq. ft. of living space with four bedrooms, three baths, formal living and dining rooms plus a tandem 2-car garage. The kitchen is ideal for entertaining, with a granite countertop island and a custom hutch that opens to the family room and café. The 18x14 guest suite is perfect for visiting in-laws or extended stay guests. And the signature wrap-around front porch provides for another great space to entertain and enjoy the ultimate Florida lifestyle at Eagle Landing. The Normandy Model Home at 1801 Duthie Park Court in Durbin Crossing North is a 100% Energy Star Certified home that features 4,308 sq. ft. of living space, with five bedrooms and three-and-a-half baths. This award winning home offers flexibility for a variety of families, with formal areas, a first floor game room, and a private family loft. It also features dramatic 20’ volume ceilings, a fireplace in the family room, a gourmet kitchen with an island, and a 3-car garage. Energy Star rated for an estimated $193.00 per month electric bill. The 2013 Northeast Florida Builders association Parade of Homes was one of the largest ever with more than 60 model home entries throughout Northeast Florida. The 2013 Parade of Homes was held from 27 April through 5 May and all visitors had opportunity to win custom outdoor kitchen.